To find in depth knowledge and tips on hoof care, click on the reports below to download. Please fill out your contact details or check your saved details are correct before downloading. Utilise this form to record any signs of lameness and conduct a farm audit. Sound interesting? 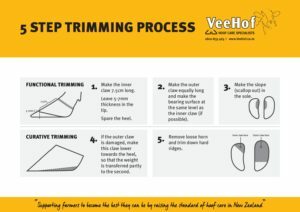 Enter your details in the form below, then click the download button to download the full Hoof Trimming Report form. 1. Make the inner claw 7.5cm long. Leave 5-7mm thickness in the tip. Spare the heel. Sound interesting? Enter your details in the form below, then click the download button to download the full 5 step process. Zinpro – Digital dermatitis is often referred to as hairy heel warts and is a common infectious foot disease in dairy and beef cattle herds. Digital dermatitis is often referred to as hairy heel warts and is a common infectious foot disease in dairy and beef cattle herds. Sound interesting? Enter your details in the form below, then click the download button to download the full Digital Dermatitis Poster. 1. Normal – Stands and walks normally with a level back. Makes long confident strides. Sound interesting? Enter your details in the form below, then click the download button to download the full Locomotion Scoring Chart. Sound interesting? Enter your details in the form below, then click the download button to download the full Impact from Heat Stress Report. Sound interesting? Enter your details in the form below, then click the download button to download the full Claw Lesion Identification Poster.